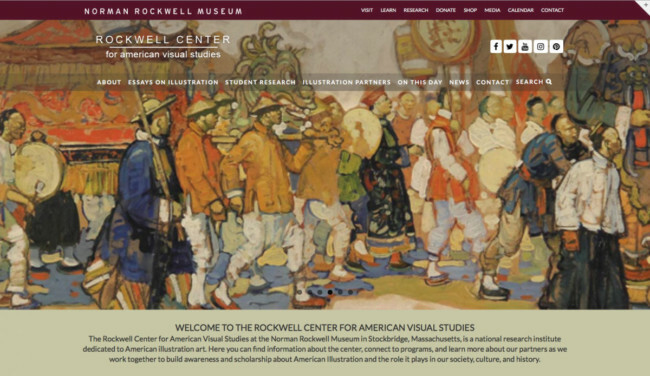 Stockbridge, MA, October 15, 2018—Norman Rockwell Museum’s Rockwell Center for American Visual Studies and the D.B. Dowd Modern Graphic History Library at Washington University in St. Louis, Missouri, announce a call for proposals for “Illustration Across Media: Nineteenth Century to Now,” a symposium to be held at Washington University from March 21 through 23, 2019. The deadline for proposals is November 1, 2018. The interdisciplinary conference will explore the history, context, and theory of illustration in the United States from the nineteenth century to now. A vital component of the visual cultures of advertising, design, publishing, and entertainment, illustration is omnipresent in modern America. Yet its historical, contextual, and theoretical specifics—from modes of production, distribution, reception, and repetition to mandates of communication and consumption—remain relatively unexamined by scholars, art critics, and practitioners. Likewise, a taxonomy of the field—shared definitions of illustration, for example—is lacking. The symposium aims to bring together scholars and researchers across multiple fields including art history, history, visual and material culture studies, American Studies, consumer studies, book arts, childhood studies, literary criticism, media studies, and more who would like to join others in constructive conversations focused on developing the emergent field of illustration studies. Interested scholars are invited to email proposals for 15-20 minute papers, together with a 2-pp CV by November 1, 2018 to Jana Purdy, Norman Rockwell Museum, at jpurdy@nrm.org. Proposals should include: name, mailing address, contact number(s), email, title of paper, and an abstract—maximum 200 words—of the paper. Applicants will be notified by November 26, 2018 regarding acceptance of their proposal. For more information and a list of proposed topics, visit the Rockwell Center website at www.rockwell-center.org.